Mr. Bobo and Mr. Beers are big fans of Sunday Funday. Sunday is our favorite day of the week. It’s a day to sleep a little later. It’s a day to have a latte from Olmos Perk and a Torres Taco from Taco Haven. 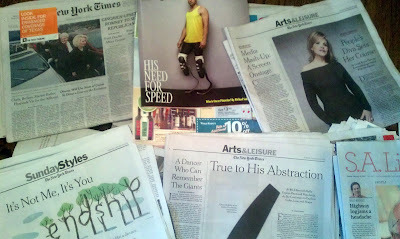 Sunday’s a day to slow down and pass the various sections of the New York Times back and forth for leisurely reading. Some Sundays there’s church. Sometimes there’s shopping. And sometimes on Sunday afternoon there’s a trip to a local watering hole for Happy Hour. Pegasus is the usual Sunday afternoon spot. The drinks are cheap and strong. The crowd is friendly and fun. One Sunday a couple of weeks ago we found ourselves at Pegasus enjoying a refreshing adult beverage when a young man approached us and said, “I just heard that you guys got married. Congratulations! I’d like to buy you both a drink.” We introduced ourselves and gladly accepted the young man’s gracious congratulations and the cocktails. Our beautiful friend John Edward Knowles passed away last week. We lost him to a massive heart attack that came like a thief in the night on January 16, 2012. We were all incredulous. John got up extra early several times a week to go swim laps. He was the picture of health. I can remember having margaritas and hanging out by the pool with John in our backyard on Sunday afternoons as far back as the late 1980s. Wow. That means that we probably knew Mr. Knowles for about 25 years. That’s a long time, and yet, way too short a time. You know what happens when you find someone you want to spend the rest of your life with? What happens is that you want the ‘rest of your life’ to start right then. That’s how we felt twenty-seven years ago, and that’s how we feel today. Over the course of our relationship, we’ve asked each other several times, "How do you feel about getting married?" And we always agreed that we’d do it when and if it was legal. No need for a big wedding or anything, but the validation and the legality of it would be nice. We never thought of it in terms of something that had any real possibility about it. She came to us in March, 2008. Our friend Matt Hales drove his big ol’ manly man red Ford F250 pickup to W. D. Deli early one morning with this little puppy with a bow around her neck. "She needs a home," he said, with raised eyebrows. "She’s from a litter of puppies born out on a farm, and I took her sister, but this one still needs a home." We looked skeptically at the puppy. She had one blue eye and one brown eye. She was tiny, and must have weighed maybe five or six pounds. "She’s half Australian Shepherd and half Catahoula. I don’t think she’ll get very big. She really needs a home. No pressure though." We each picked her up and held her for a little while. And that was that. She was ours from that day. 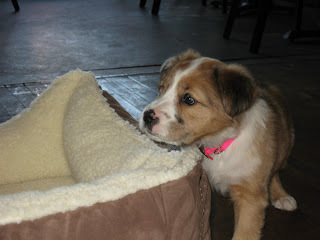 She was about eight weeks old then and we named her Mookie.